Siddha Ganapati is one among the 32 forms of Sri Ganesh. The popular belief is that by worshipping Siddha Ganapati one gets immediate relief from troubles. 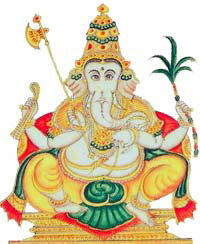 The Siddha Ganapati form of Ganesha has four hands and his color is golden yellow or green. The hands hold mango, garland of flowers, sugarcane and axe. His trunk holds sweet and sesame seeds. The belief is that Siddha Ganapati blesses a person with ashta siddhis. Success in any task is assured after proper worship of Siddha Ganapati. A popular temple associated with Siddha Ganapati is the Siddhi Vinayak Temple in Mumbai.